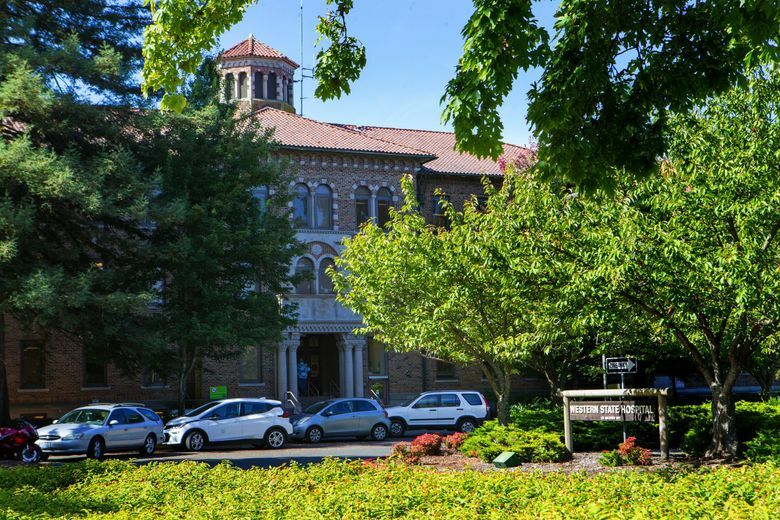 The Washington Department of Social and Health Services has requested $800 million from the state to build a new psychiatric facility on Western State Hospital's existing campus for patients coming from the criminal justice system. The agency says that trying to bring the hospital up to current code would cost more than $200 million. OLYMPIA — The Washington Department of Social and Health Services (DSHS) has requested $800 million from the state to build a new psychiatric facility on Western State Hospital’s existing campus for patients coming from the criminal-justice system. The request is one of many ideas being floated over how to improve the state’s troubled mental-health system, which has suffered from staffing shortages, safety issues and a lack of available beds for people. Western State, an approximately 850-bed hospital and Washington’s largest psychiatric facility, stands front and center of those woes. Earlier this year, federal regulators decertified Western State, located in Lakewood, Pierce County, costing the facility $53 million in annual federal funding. Years of inspection findings by the U.S. Centers for Medicare & Medicaid Services revealed a broad array of safety issues and improper use of restraints on patients. The inspections also found problems with the hospital’s outdated buildings, such as fire-suppression systems and so-called “ligature risks” — protrusions in bedrooms, bathrooms and elsewhere that patients could potentially use to strangle or hang themselves. About 290 patients currently in the hospital were sent there through criminal courts to determine their competency to stand trial, or have been found not guilty by reason of insanity. The remainder of the beds are largely used by patients who were involuntarily committed through a civil process due to psychiatric illnesses. Shortly before the hospital was decertified, Gov. Jay Inslee renewed his push for most of the civil patients at Western State — and its sister hospital, Eastern State Hospital — to be eventually sent to smaller facilities around Washington that have yet to be built. Under that plan, the state hospitals would continue to care for the patients sent by the courts. The DSHS proposal requests money through the state’s capital-construction budget to create a new, 500-bed facility on the hospital’s existing 150-acre campus. Of that, $50 million would be spread across the state capital budgets for 2019-21 and 2021-23 to cover costs related to designing the new facility. The request then allocates $750 million for construction in the 2023-25 budget cycle. That work would begin in 2023. In its request, DSHS says that Western State’s decertification has made it nearly impossible to bring the current facility back into federal compliance. Before decertification, many of the building’s outdated features couldn’t pass fire or safety codes, but had been grandfathered into the law. To get recertified, Western State would have to be brought up to current standards — at the cost of more than $200 million, according to the request. Even the hospital’s dedicated building for criminal-competency patients — a newer facility built in 2000 — might not pass muster with federal regulators. That building “may not be certifiable because the existing sleeping rooms are too small according to current national hospital standards,” the DSHS request says. No decision has been made about whether the request will be included in Inslee’s proposed 2019-21 budget, a spokeswoman for the governor’s office said. The governor’s budget plan is set to be unveiled next month, ahead of the legislative session that begins in January. Lawmakers in both political parties have broadly agreed that civilly-committed patients should be moved out of the state hospitals to community facilities, which would keep them closer to friends and family. To handle that, Inslee has proposed building a slew of new 16-bed facilities across the state, as well as other types of housing for patients who are ready to be discharged from the hospitals. Sen. David Frockt, D-Seattle, who has worked on capital budgets in recent years, said he hadn’t yet seen the DSHS proposal. But Frockt, vice chair of the Senate Ways and Means Committee, said he has heard concerns “about throwing more money into Western State” in its current form. Sen. John Braun, R-Centralia, the ranking Republican on the Senate Ways and Means Committee that deals with budget issues, said he’s concerned about the potential costs.